Road to Change tour seeks to gain support for stricter gun safety laws in midterm elections. WASHINGTON — Student activists behind last spring’s national March for Our Lives protests have been carrying their message into key states leading up to this fall’s midterm elections, hoping to mobilize young voters behind a drive to enact stricter gun control laws. The national tour, called Road to Change, aims to increase voter registration, energize young voters and boost turnout for this fall's midterm elections. "Last midterms were the lowest turnout since World War II," Road to Change student organizer Jaclyn Corin told NBC News. "I truly believe that this is going to be the highest turnout ever. People are waking up to this issue because unfortunately people wake up when tragedy strikes." Leaders hope to encourage voters to look beyond party labels and examine policies of the candidates — as well as where they are getting financial backing for their campaigns. Although Road to Change has a clear message, they will not endorse individual candidates. "That is the last thing we are ever going to do. We are not here to run around advertising for candidates," Parkland student Cameron Kasky explains. "We believe in policies and principles, not people." While the idea for March for Our Lives and Road to Change was launched by Marjory Stoneman Douglas High School students after the February shooting that left 17 of their fellow students and staff members dead, the effort now combines a core group of Parkland students with activists across the country. This summer, Road to Change is making more than 50 stops in over 20 states. A group of Road to Change leaders also organized a separate tour specifically for Florida, where they have visited all 27 congressional districts. The students organize rallies, town halls and voter registration drives, often in places affected by gun violence. Other stops focus in on areas of the country with particularly strong NRA support, which activists say gives them the opportunity to have a productive dialogue ahead of the elections. Their ultimate goal is to boost youth voter turnout. A new analysis from Democratic data firm TargetSmart shows that new registrations among voters 18 to 29 have jumped in several key swing states this year. In Pennsylvania, the share of new registrants 18 to 29 has risen from 45 percent to 61 percent. In Florida, home to the Marjory Stoneman Douglas students, it has jumped 8 percent. Other key states, like Virginia and Arizona, have seen similar increases. While those are encouraging numbers for the Road to Change team, they say there is still much more to be done. By using social media platforms to spread the word, organizers say they have reached 50,000 people through their events. But those attendees aren’t always in agreement with the Road to Change mission and protesters have tagged along with the tour. Bryan Melchior, the co-owner of Utahgunexchange.com, follows March for Our lives everywhere they go. "We have followed the March for Our Lives wherever they go and we bring with those messages that seek to protect and preserve the Constitution," Melchior told NBC News. 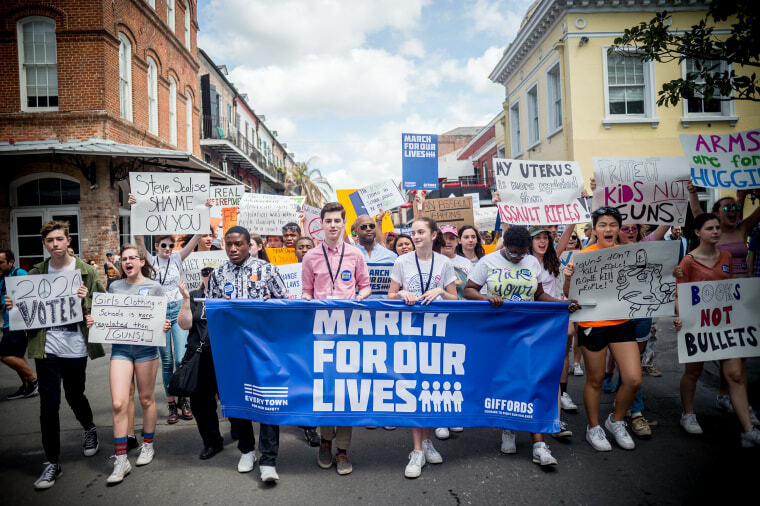 "You have March for Our Lives, which seeks to deprive Americans of a civil right, and then you have us on the other side that says our civil rights are important to us and we have messages that protect and preserve them." But, while they disagree on the issues, their exchanges are civil and sometimes even productive, says Melchior. "We have gotten close to some of the students on a first-name basis," he said. "We have had dialogue and have found common ground." After the tour ends later this month, students plan to continue to discuss policies around the country, visit college campuses and register people to vote, especially in the two months before the midterm elections. Some student organizers, such as recent Parkland graduate David Hogg, are taking gap years in order to continue their work. In an interview, Hogg said he believes the efforts will affect voters in November "by making people realize it is possible to practice the Second Amendment, and gun safety, and have common-sense gun laws like extreme risk protection orders and universal background checks." Cameron Kasky, who is about to enter his senior year Marjory Stoneman Douglas High School, told NBC News that even when he goes back to school, he is going to continue to organize and travel to keep registering voters before the midterms. "I like to think that as long as we have work to do, we must continue to push forward," he said. "It is not always easy but we are alive, not everybody gets to say that, so as long as we are, we like to do the best we can with the time that we are lucky enough to have."